Over the last year the East London neighbourhood of Walthamstow has become a regular destination for us as a result of the work of local street art organisation Wood Street Walls (Previously on Hookedblog) and the talented street artists who they have enlisted to painted murals across the borough of Waltham Forest. We have lost track of the number of times we have visited over the year to photograph some of the artists at work on their murals, on occasion arriving either too early or late in efforts to capature some of the working process or the best light for the final shots. One such visit saw us photographing the mural work of artist ATMA, a Blackhorse Road resident and one of the founding artists of the Wood Street Walls Project. This was one of those murals where we unfortunately missed the artist at work only managing to capture images of the finished mural. 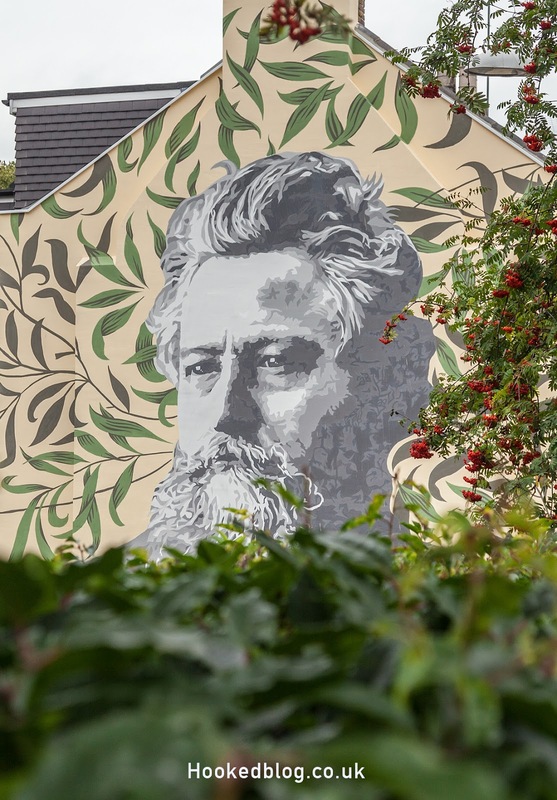 Painted on the gable end wall on Bedford Road, ATMA’s mural features a large scale stencil style portrait of English textile designer and leading member of the Arts and Crafts Movement William Morris. A one time Walthamstow resident, Morris’s family home located next to this mural from artist ATMA, now houses the William Morris Gallery. We have previously featured ATMA’s Morris mural on the blog, first posting about it here back in September 2016. Following the release of a short film online documenting the entire story of the mural from the initial discussions, the voting, the installation to the actual painting of the mural we figured it was worth sharing some of our images of the mural again along with this film. You can watch the short film below featuring the William Morris Mural below which has been produced & directed by Ric Toone of Videobop, also a Wood Street resident. 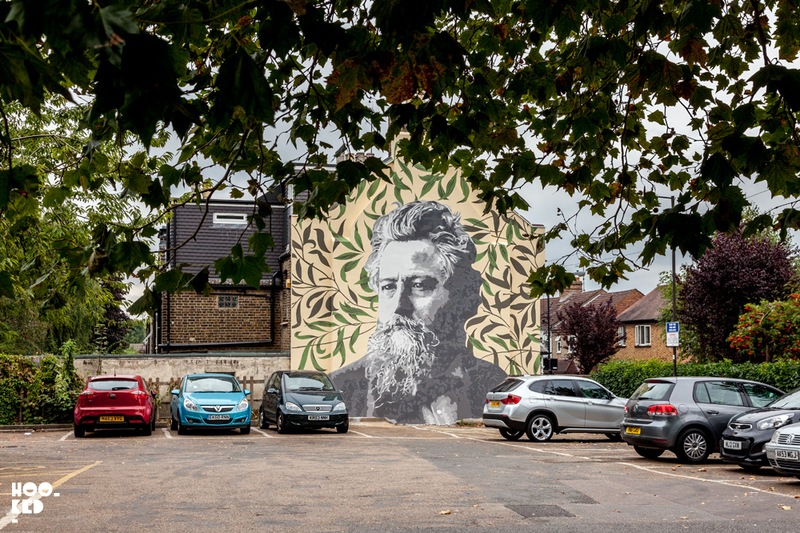 The William Morris Mural painted by ATMA is located on Bedford Road, Walthamstow overlooking the car park opposite the William Morris Gallery. 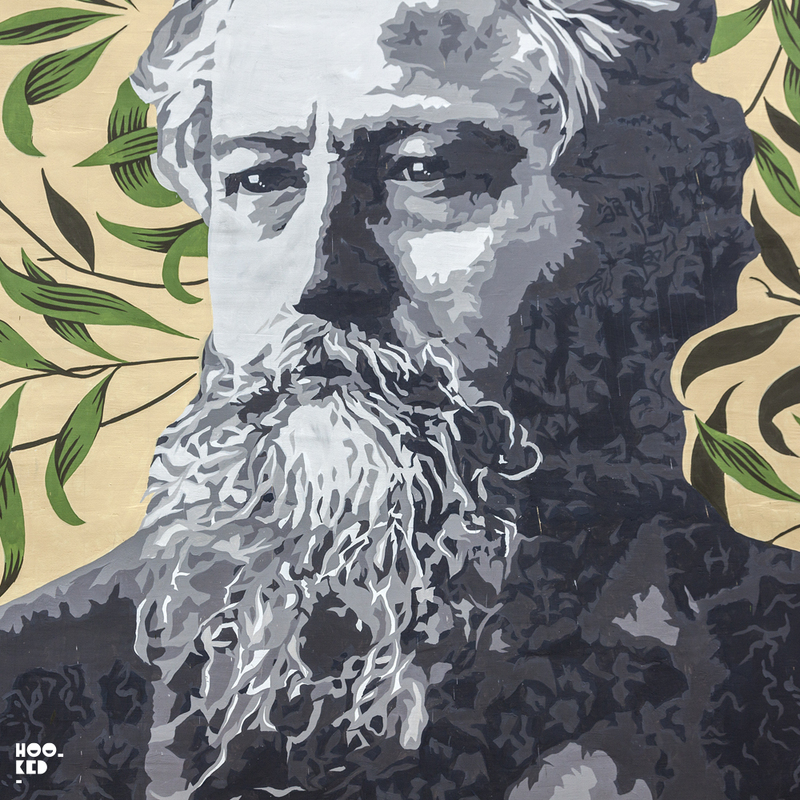 If plan to visit Walthamstow to check out the mural can we suggest you also visit the excellent William Morris Gallery where you can learn more about this famous local and the British Arts and Crafts Movement. The William Morris Mural painted by artist ATM in Walthamstow.